As I get older, yes, almost 30! Ick.. I realize it's getting much harder to keep my flat stomach. I've heard of cellulite creams, face creams and other creams to make your skin firmer, but this is the first time I've heard about cream to firm and tighten your tummy. The Mama Mio Get Waisted Body Shaper ($56) is the holy grail of slimming potions; packed with NINE well proven ingredients designed to help combat fat deposits, tighten your tum, reduce puffiness, and – most importantly – maximise lipolysis. It's a great alternative to costly liposuctions and tummy tucks which are not only expensive but can have horrible side effects. Lipolysis is the way your body breaks down the fat stored in fat cells; giving you slim fat cells and a slimmer silhouette. Get Waisted’s ingredients are well proven in lab tests to dramatically increase the destruction of fat. If fat is the enemy, let us introduce you to your new best friend. This is made with caffeine, which increases micro-circulation. Crazy right? Celebs that love the Get Waisted Body Shaper include Kimora Simmons, Halle Berry and Jessica Alba. So how does it work? 2 Pumps is all you need a day to get a perfect tummy. Using large clockwise strokes, massage into your tummy for at least 30 seconds. Once a day for 30 days. I just started using the Body Shaper, so I have not seen a difference yet, but the one thing I was surprised by was the smell. It has a peppermint scent to it, which I really like. I found it was better to use the cream at night so I wouldn't move around too much and it could absorb better. Who would like the Body Shaper? If you're trying to get into last year's pair or jeans but can't seem to shed that waist line, the Body Shaper could help. Of course good diet and exercise PLUS the body shaper would do wonders for your mid section, I wouldn't rely JUST on this product to shed that tummy. Lately I've noticed my tummy expanding so I've been doing sit ups plus the Get Waisted cream, and I'm hoping I will see results soon. 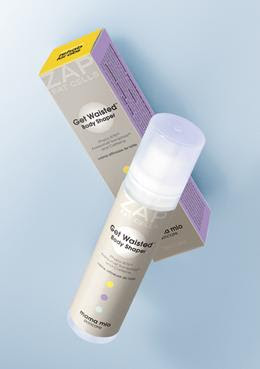 You can buy the Get Waisted Body Shaper (100 ml bottle) for $56 at Mamamio.com. $1 for every bottle sold will be donated to the cancer support charity "Look Good, Feel Better" I think the Body Shaper is a great way to get that flat stomach we all long for. I'm sure many companies will follow in their lead in creating tummy flattening products. I received a sample from a PR rep working with Mama Mio. All opinions are my own.